Arrests and removals towards the south of the country continue in the border regions, but we have also witnessed attempts far away from the borders that attempt to make the lives of many migrants as difficult as possible. In the evening of the 7th of July, the Moroccan authorities began evicting the camp next to the train station in Fes, which was home to more than 1,700 people. For eight years, the self-organised camp has been a place where people could rest and recover after being deported from the border areas. During the eviction, the police burned tents and personal belongings, stole phones and money, and hundreds of people were deported to Marrakech, Beni-Mellal, Agadir and Essaouira in more than ten busses. 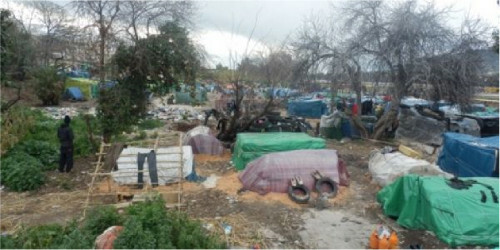 The new Spanish government has promised to improve the situation at Spain’s southern borders. Amongst others, the Spanish president Pedro Sanchez announced that he would work toward taking down the barbed wire covering the fences between Morocco and Ceuta and Melilla.5 On 28th of June, the Spanish interior minister Fernando Grande-Marlaska visited his counterpart Abdelouafi Latfit in Rabat in order to discuss – among others – the illegalized migration movements from Morocco to Spain.6 The ministers announced that the concertina barbed wire will only be removed if the ‘security’ at the common border can be assured alternatively. The idea of :: detention centers in countries of origin and transit has been widely discussed in the last weeks within the EU, but this idea was rejected by the Moroccan foreign minister Naser Burita, who announced after the meeting with the Grande-Marlaska that Morocco ‘rejects and will always reject’ those kind of centers as they appear to be an ‘easy solution’ for the EU, externalizing the ‘problem’ but not addressing it.7 Further developments regarding facilities on Moroccan soil remain to be seen. 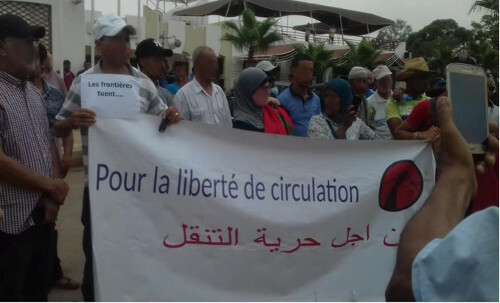 Alarm Phone activists from Oujda as well as other Algerian and Moroccan activists called for a joint march on 22nd of July towards the common border of the two countries, starting from Oujda (Morocco) and at the same time from Maghnia (Algeria). 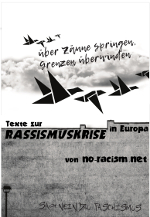 The activists demand to re-open the border that has been closed since 1994.10 They demand freedom of movement and oppose the border externalisation strategies of the EU. This very border crossing between Maghnia and Oujda is one of the most dangerous entries to Morocco for travellers as it is highly secured and consists of deep trenches and a high fence. An open border in this region would be crucial for the travellers to reach Morocco safely and for the struggle for freedom of movement. Every two weeks activists will march now towards the border from Oujda, Morocco, with the next march scheduled for the 5th of August.